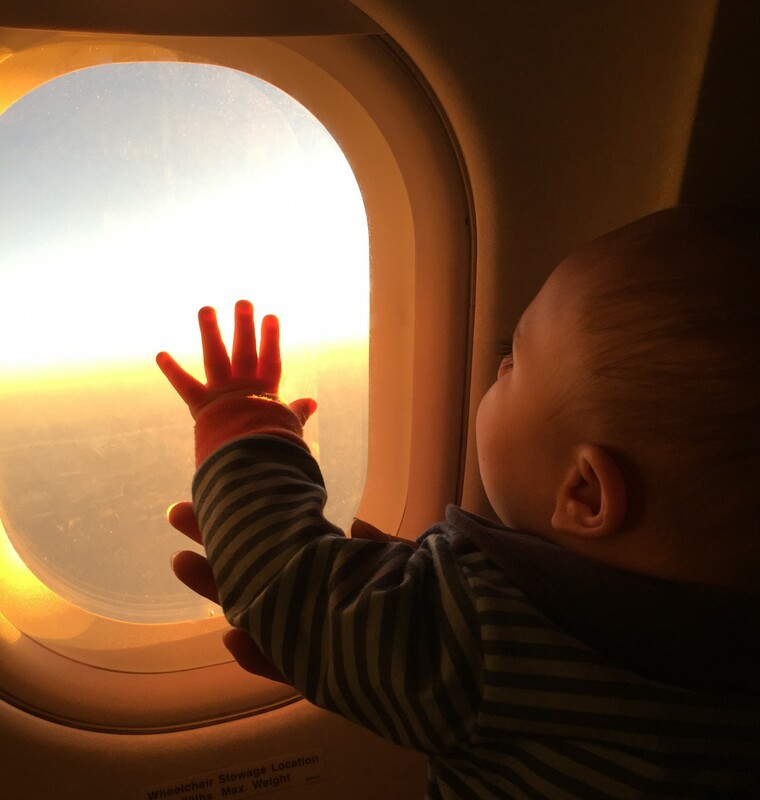 Travel with Baby Must Haves: Less is not AnyMore! So you are going on your first trip with baby, and you are freaking out about what you need and how you will carry it all with you. Hubby and I were in the exact same boat. Well, except, I was a flight attendant. So, I was a tiny bit knowledgeable on what would probably work best, but it’s mostly just trial and error. Lucky for you, I’ve done the trial! On our first trips, packing for baby was fairly easy because my mom was generous enough to buy the essentials for us to keep at her house. If you are traveling to the grandparents you may invest in purchasing a pack n play, car seat, baby bath, toiletries, some toys and books to keep at the grandparents. For the purposes of this post, let’s assume you won’t have these things at your destination, and you are traveling by air. Which, by the way, goes much smoother for us than the car. I’m not kidding! Obviously, every baby is different, but our little man is much happier sitting on our laps and playing than strapped into his car seat for hours. With air travel this means you are keeping in mind not only weight limits on luggage and fees for extra, but also your ability to carry it all! These are things you must take in order to keep baby safe, healthy and warm during your traveling. These items I keep with me at all times, at all times, never check them. I’ve read terrible stories of moms not having what they need inflight or after. While it makes me feel terrible for them, I also feel they are partially to blame. So, please, listen here, never ever check your only bag of baby food, breast pump (if it’s crucial to feeding your baby), formula, bottles, diapers, wipes, what have you! Just don’t do it! If they say you must put your bag under the plane, which won’t happen if you board first like the airline suggests (more on this in a post about surviving flight with baby), then you stuff those items in your pockets, handbag, whatever is on you. So here it is. I fit all of this in my personal item and my one lap child personal item. TSA allows people traveling with a baby to bring water, breast milk/formula, puréed foods and ice packs through without size/amount restriction. So no worries there! Diaper Bag: this is the bag I will put up top if I need to. Therefore, I fill it with items that I likely won’t need until after we have reached a cruising altitude. Diapers, A diaper for every hour until you will be able to get to a store to buy some. Always assume your luggage will get lost and baby will have a pooping spree. Plus, a super fresh diaper keeps baby happy. Wipes, I bring an entire pack. They just come in handy in so many situations you can never have too many! Breast Pump, Pumped milk, Formula, Water, Bottles, Sanitizing Wipes, Sanitizing microwave bag, Any and every milk/formula feeding supply you use! So for us this breaks down to my thin nursing cover scarf, which I wear to save room, a hand pump, 1 sterilize microwave bag, 1 small pack of pump cleaning wipes and 1 bottle. If I didn’t breastfeed, I would bring formula and those supplies the same as diapers, more than enough until I knew I could reach a store to get what I need. Then, once I’m through security, I purchase a big huge water bottle to carry in my hand on the plane. It is just worth the extra bucks to me to not carry it until then. Baby food/solids and supplies, for us this is a couple of boon squirt spoons (not the official name, and I don’t get endorsed by them), 1 boon feeder stick, and enough baby food packs to last a meal past our estimated arrival. Add snacks to that if your baby is on to finger foods. If your little one isn’t on solids yet, yay you get to save room in your bags! Extra outfit for baby plus some, I mean a full outfit including hat, gloves, socks, sweater, whatever s/he will need when you get there. Always assume there will be 2 blow outs and a major projectile spit up. A dirty uncomfortable baby is not worth saving the space. Their clothes are small anyway. I usually pack a one piece outfit of some sort and footie pjs. The fashion police won’t be arresting your baby for wearing pjs after a blow out on an airplane! Also, for international long flights change baby to sleepwear so they will be comfy and to help them understand that it’s sleepy time. If you use a Sleep sack put it in too. Extra shirt for you and your partner, again, the fashion police won’t be cuffing you for wearing a basic t-shirt after your child’s projectile spit up. The people around you however, will be nauseous and frustrated if you leave that rotting on your chest the entire hot and crowded flight. Which leads me to the goddess of the diaper bag, and well every bag I own! PLASTIC BAGS, Oh the uses are endless when you have a baby! I bring both sandwich and freezer size ziplocks, plastic store bags and a little roll of doggy poop bags (purchased at the dollar store). Why so many bags? Well, the spit up clothes go in the store plastic bag, the poop clothes go in the ziplock freezer bag then in the store bag, and I do that so I can carry those around by the handle and not have them touch anything else. The dog bags are for the dirty diapers, and the sandwich bags to keep the cleaned off/wiped off toys clean and together. Plus, the millions of other uses you will come up with at the time of need. My Personal Item: which really isn’t mine much at all! This is the one I put under the seat in front of me. Changing pad/diaper clutch, I use a diaper clutch that turns into a changing pad and holds 2 diapers plus a travel wipes case. This isn’t necessary, I just find it convenient to slip on my wrist and be able to hold baby securely with two empty hands and arms. You will need: your changing pad (and/or disposable ones which I put a couple in the clutch as well. I know it is wasteful, but those planes can be really dirty), travel wipes, and 2-4 diapers in this bag for when you may need one immediately and getting into your diaper bag over head seems like a hassle. After those diapers are gone you will just refill from the diaper bag. Also, I keep a travel size diaper rash ointment in my clutch. Blankets, two. One thin muslin, one thicker fleece/minky style. You never know if it will be warm or cold on a plane. I also throw in a few burp towels/blankies for obvious reasons. Books, yes, bring the favorite book! it is worth the risk of losing it if it saves you on what could possibly be hour 7 of a nine hour flight of little to no sleep. Never happened to me, yet, but I wouldn’t risk going anywhere without the little blue truck books. We take 3. He enjoys the same ones over and over. You know your kid best, so that’s up to you on how many. Also good to bring one for yourself, although I’m a big fan of sleeping when baby sleeps. Especially, if you are switching time zones. Hydration and rest are your friends! iPad, we don’t practice that old no screen time until 2 yrs old philosophy. If you do, great, you won’t need to spend money on downloading expensive foreign language programs for your child. We use the Little Pim Italian series. I like them fair enough, wish it used different voices and not a super cartoonish one, but hey, he loves it. It reinforces the Italian I speak to him, keeps him happy for at least a half hour and it’s educational. He also loves Thomas and Friends, so we have one of those movies on there too. These are mostly our car tools. We have a rough time around 3 hrs in the car. It might be a good idea to use a fun language program in the language of the destination to introduce your little one to what they are about to experience all around. Hand sanitizing wipes, planes and plane water are nasty. I wipe down the whole area of our seat with one (or three) before we sit. That way if he is touching everything, then eating his hands, I can feel a little better about it. I use babyganics sanitizing wipes because they are all natural and don’t have that nasty taste. Water, sippy cup, snacks, gum, I purchase a big water past security so I don’t have to purchase any inflight or wait for it even if it is free. I use that water in the sippy too. Remember plane lavatory water not safe for drinking or even rinsing baby stuff! I have never experienced jet lag😁 Hubby, not so lucky. I believe it’s because I’m a camel and I sleep on the plane. I drink a ton of water, which means I urinate quite a few times. I don’t care if that means asking someone to move 100 times, and you shouldn’t either. My theory is fly first class if you don’t want to be conscious of others. Also, just thought of this, I would put a bottle already filled with formula in here too (or have it measured out ready to be made, however it works). Sucking during take off helps baby’s ears. We nurse during both takeoff and landing. This will keep baby hydrated well. Trust me, this is really the key to a refreshed landing. Planes are super dry! All Travel Documents and Money, I use a big travel wallet. Keeps me organized. Never check your wallet, not even gate check it. I’ve heard horror stories of this too. Keep that stuff with you. If you are told there isn’t room onboard for your bag, take that stuff out and put it in your pocket or hold it. You can not trust that you will ever see your bags again if you aren’t personally holding them. Other carry-ons/gate checks I highly recommend, but you may feel aren’t necessary. Baby wrap/carrier, You will want to baby wear your baby. Why? It allows you to have free hands. This is vital if you are traveling alone! Going to the bathroom will be much easier, you can carry/stroll all of your carry ons in your stroller and during security you will just keep baby right in there and walk through. This allows you to remove and put on your shoes with ease, grab your bags and stroller, unfold the stroller no problem, everything will be easier, two hands are always better than one. I use our carrier instead of wrap at the airport simply because it’s less fuss getting on and off. I usually prefer a wrap, but rewrapping in-flight is too much for me. High quality travel or umbrella stroller, I say high quality and travel or umbrella because of how we use our stroller. If you have a hop in, hop out toddler, and don’t want to pile all of your personal items in it, a small cheap umbrella stroller might work for you! I have extreme standards for my strollers. They are used more than our car and car seat, though, so I need them to be reliable and functional for our lifestyle. For us, this means to travel with we use the BabyJogger Vue Lite (still not getting endorsed here, although I should because I’ve been stopped and asked about it a million times and always recommend it to people! Same with our Stokke Xplory, but another post for that). This umbrella stroller is the queen of umbrella strollers if you ask me! It has a sturdy lite weight frame, I have carri while wearing little man through the airport until after security! It has both in and out facing that only requires one hand to switch, front wheels lock, giant sunshade, I can go on and on, so likely a post will be coming about why I love it and highly recommend it. But back to traveling with a stroller. We go with the umbrella because it’s easy for us to carry. Not just at the airport, but also at our destination. We load it up with our personal items, then gate check it, then use it again to stroll personal items, but if we are taking a train, getting in a car, going up stairs, or if the heavens ever align and we get first class, we can carry it on with us no struggle! Purchase a gate check bag or the bag that matches your stroller, it will help protect it and it keep it clean. I’m not sure they will give you a plastic bag like they will for a car seat. You can also check it instead of gate check it if you want. And that’s it folks, well, for what goes past security with you! Now to the checked items! What and Why I Check it: A story of more is less, but less is also more. We all share one large hard case, unless my husband is traveling for work, then he has a garment bag for his work clothes to stay well pressed. It is just easier to have one big case that way only one of us has to worry about a suit case and the other wheels the car seat (if we bring it). One bag doesn’t change our ability to bring all of this, though. Clothes for baby, less is more here for us. We always stay somewhere we can wash our clothes or have them washed. Many hotels have these options or check your rental and the local area for one. You can buy hand wash baby detergent in the travel section of buy buy baby, but I only use it for treating stains immediately. I don’t like hand washing, thougg. For baby, I bring one outfit for every day of the trip or one outfit for each day of a week if the trip exceeds a week. Our little man can use up to 3 outfits in a day on a rough day, so this number of outfits insures day 1 of a trip I won’t be slave to a washing machine. I bring the same number of jammies. To keep organized, I put the full outfit in a plastic bag. Hat, socks, onesie, shirt, pants, sweater/jacket, bib, all together so it’s never a question or search for what he is supposed to be wearing. I also always bring his rain coat, and a couple pairs of shoes. Always be prepared for any possible weather. A cold wet baby makes a bad trip. Eating Supplies, invest in a travel high chair/booster, we use a over the chair kind. It folds into a little pouch, great for countries that don’t typically have high chairs. If you’re staying in the US, a high chair cover will work. Bibs, I like a mix of wipe off and towel kind, 4 of each works for us. We love the Boon feeding products. I pack the squirt spoons, the feeder sticks and then we have no need for bowls! The stick we use most often, especially for eating out. We have a good eater who will eat just about anything. We have put sushi, pasta, chicken tikka masala, just about everything in that boon feeder and he has eaten it no problem, and we started doing those foods at 6 months! (But please talk to your dr first, every baby is different) This little tool also saves us from bringing a bunch of baby food with us. Which you can likely buy at your destination, so no need to over do it if you are doing all puréed baby foods. I just bring a few with us incase we can’t find anything on a menu for him or at the hotel breakfast. For warming bottles many hotels have in room coffee makers or will be glad to bring you hot water free of charge. I have never used formula, but I imagine you can warm it by placing the bottle in hot water just like breastmilk. Just be careful not to burn your fingers as the coffee pot water gets super hot!! Travel Sleeping Solution, this one I don’t have much personal advice on, we bed share, cosleep, sleep share, whatever term you prefer. We do use a Kidco Peapod. It’s like a baby tent/play yard combo that folds into a small little circular bag with handles. It says it’s for one year and up, so we don’t leave him unattended in it, but it’s great for picnics, the beach, naps, anywhere baby wants to lay down or play. We just pop it up and he can stretch out while being protected from the sun as well with the spf fabric. We keep it under the umbrella stroller, in our big tote or backpack wherever we go that day. If you have an older baby it could be your nighttime sleeping solution. I’ve also heard great things about the baby bjorn travel crib, which looks like a play yard. It is light weight and folds up small enough to fit in a large suitcase (I believe). I haven’t used it, but if we didn’t cosleep I probably would. It will take 13 lbs from your 50 per case, so I definitely wouldn’t call it compact in general, just compact for what it is. Now, this can all be saved if you book a hotel with cribs and call to reserve a crib before you get there. I would bring my own rubber (water proof) sheet and fitted sheet. Baby likes consistency, so this little touch will help baby sleep and ensure baby won’t have a reaction to the hotel detergent. Diapers, we have an honest diaper subscription so if we aren’t going to go over weight, I pack them. Plus, when they are gone I have plenty of extra room for the purchases from our trip:) Otherwise, I say buy them there if you aren’t brand loyal or know you can find your brand at your destination. Bath time, Get an inflatable baby tub! You won’t need a bath tub to use it, you can take it to the pool or beach and use it like a baby paddling pool, they fold up small, weigh nothing and our little guy loves it! I bring a few of his baby wash cloths with fun prints to double as a toy and a couple of his smaller bath toys that he can play with outside the bath too. We bring his favorite Thomas hooded towel along as well. It can be used at the pool/beach if needed. The hotel towels are fine though, and towels are good to eliminate if you find yourself needing more space or less weight. Travel Size Baby Toiletries, baby won’t need a full size version. If you’re worried it won’t be enough bring two. Those full size bottles add unnecessary weight. Nail clippers, brush, tooth brush in here too. Add to this travel size baby detergent packs. I just wash all of our stuff together with it. Pool/Beach needs, you have your inflatable tub to keep baby cool and safe while enjoying water, the Kidco peapod to protect their precious fresh skin from the sun while lounging, but what about when you go in the pool or ocean? A good pool sun hat is a must. One with spf fabric. The sun penetrates regular fabrics. Baby is very sensitive and might not have much hair to help protect their scalp. We have a fun Thomas one that came with matching water socks/shoes, another necessity to protect baby from hot sand/pavement, pebbles, shells, anything really. They don’t have calloused feet like us. An spf fabric rash guard, even if you think it’s too hot for a shirt. Better to protect from the sun than worry about the extra heat. If it is that hot in the shade, baby shouldn’t be out that long. Last, swim diapers. That’s personal preference whether disposable or cloth. I like disposable for trips at hotels because I don’t have to clean them, but I do worry about the chemicals. I put it on right before the water and remove it immediately after he comes out, the less contact time, the better. Floaties, we haven’t used any yet, but I think the blow up kind wouldn’t be a problem to bring from home. Basically, it’s the blow up tub with a hole in it. Sunscreen, If baby is old enough and your dr said its ok. A baby mineral based sunscreen is great even if you’re not going to a beach or if it’s not even hot. The sun can burn us anytime of the year, in any weather. We use the babyganics brand, and it works well for all of us. An Extra Thin Blanket and/or Sleep Sack, whatever baby uses at home to stay warm and comfy while sleeping. For us it’s footies and a thin muslin blanket. So in addition to the ones I bring for the plane, I bring an extra in the checked bag. Stroller Rain Cover, if you bring your stroller. The left over space is all for you (and your partner) to bring whatever you need, I’ve seen some people just use a separate bag for themselves. I would do this for a particularly long trip or one without laundry facilities. If you will be using a car seat bring your own to check for free! Car rental company’s charge an arm and a leg for them, and they are known for being terrible and unreliable. Don’t risk it. Spend that money on a nice case for your car seat that will make it easy to travel with. It will check free on every airline I know of. We use the Munchkin-Brica Cover Guard Car Seat Travel Tote. It wheels easy and has a backpack carry option. This is awesome for us because hubby backpacks it onto the train while wheeling the suit case and lifting it no problem if needed, or I can wheel it wearing the baby if I need to. We have the Maxi Cosi Pria convertible car seat. If you have one of those big britax seats, I don’t think it will fit in our travel tote. You would likely want to just get a wheeled one for that bad boy, anyway. Leave a comment if I left anything out, if you have any different travel with baby must haves or just want to share your own baby travel list! ** again I don’t get anything for recommending products, this is all just my personal opinion and (I wish it wasn’t so) purchased by yours truly . *** going to add pics of us using some of the travel products I like soon! Mexico City, to go or not to go? Forgot to post an update on baby Fitz! 48 hours in Holland, MI and Bash’s first horse race!